Written by Paula Cuadrado, Media Programs Specialist at Seacrest Studios Video by Chance Harris, Media Programs Manager at Seacrest Studios ________ I love being able to tell our sweet patients that, yes, one of their favorite super stars is coming to see them right here in the hospital! I knew Sabrina Carpenter was interested in visiting to our Seacrest Studios at Children’s Medical Center in Dallas and right before we nailed down the date and time, I was spending time visiting with one of my little friends who has frequent and lengthy hospital stays. Ariana, who is seven, loves to interact with the Seacrest Studios. When she’s admitted here in the hospital, she usually can’t leave her room which means we bring the fun to her through our tv channel and by stopping by to see her. She loves to play Bingo and is always gracious for the prizes she wins like little ponies and stuffed animals. The week before Sabrina came, she asked me if any celebrities were coming soon (her last hospital stay she got to talk to Keith Urban!) I asked her who she’d like to meet and told her, “I hear Sabrina Carpenter will be in town next week, should we invite her?” Her eyes widened and her head nodded up and down showing a big YES! I played it cool and told her I’d reach out and see if she could stop by, wink wink. When we had the date and time confirmed, she was the first one we told! She almost couldn’t believe it! Since she wasn’t able to leave her room and join the crowd in the Seacrest Studios, we set her up to do a live video stream from her room so Sabrina could see her and talk to her, too. Ariana stroked her toy pony’s hair and asked Sabrina what she likes to do when she’s bored. 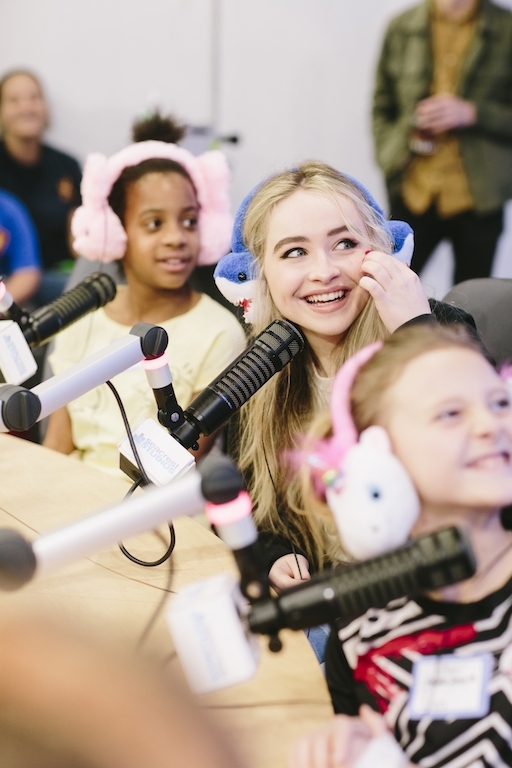 Several other patients got to sit next to Sabrina in the Seacrest Studios and ask her all their questions about her music and her roles on Girl Meets World and Adventures in Babysitting. It was so cute to hear the kids ask about specific scenes they remembered and ask their new friend about what was going on behind the scenes. Right before Sabrina arrived we played her music in Seacrest Studios, and Jackee June requested her song “On Purpose.” That’s the song she ended up playing for the kids – a live, rendition of the song Jackee June had just requested! What a memorable moment! After the interview, Sabrina signed an autograph for every kid who came by, and extras for those who couldn’t. She hugged many of the kids and took plenty of selfies with her fans. When the crowd cleared, she got to talk with Ariana again through the video conference. Ariana loves the app Musical.ly and is an expert at making fun videos set to music. She asked if Sabrina could make a musical.ly video with her and the two lip-synced and danced together to make an awesome clip! When a celebrity such as Sabrina comes to visit Seacrest Studios, the impact goes far beyond the hour or so they are there. The anticipation leading up to the event is a positive distraction from the hospital world and the memories they make during the visit are the details they share with friends and family about their time away from home. And every now and then there’s the once-in-a-lifetime musical.ly to replay over and over again! Thank you Sabrina for loving on our friends here in Dallas! We’ll see you next time!